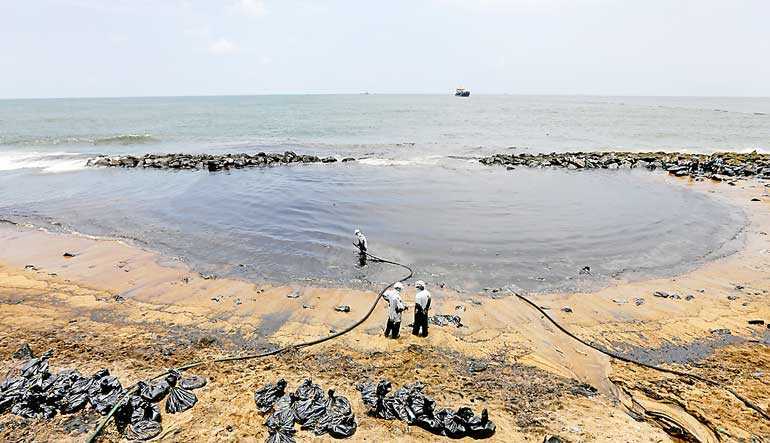 As clean-up efforts continued into a third day, the Ceylon Petroleum Corporation (CPC) yesterday said they were yet to calculate projected losses from the oil spill, but ruled out any fuel shortages as a result of the leak. CPC was grappling with cleaning the leak, which is reported to be about 1.5 metric tonnes of fuel, but had not calculated losses for insurance and other purposes. “We still don’t know the economic impact of the oil spill, because we have been engaged in minimising the environmental pollution and repairing the damaged pipeline,” CPC Chairman Dhammika Ranatunga told Daily FT. He said CPC would only be able to give a comprehensive picture of the financial impact of the incident by Friday, after referring to the shipment logs and CPC data. According to him, the CPC had imported 31,000 MTs of crude oil from Port of Fujairah in the United Arab Emirates. They believe around 5% of that has been leaked so far since detecting a 1.5 nautical mile oil spill last Saturday in Muthurajawela. However, he said it was still difficult to speculate on the total damage until they refer to the data. “It will take at least another three to four days to repair the pipeline and control the oil spill. On Monday, we saw the oil patch has moved towards Uswetakeiyawa,” Ranatunga added. The Chairman also added that they will use helicopters to spot any further oil patches in the area. It was earlier reported that despite urgent recommendations by a three-member Cabinet Sub-Committee in November 2017 to reconstruct and make operational Sri Lanka´s main pipelines, which carry refined petroleum products from the Colombo Port to the Kollonnawa storage tanks within three months, the Ceylon Petroleum Storage and Terminals Ltd. (CPSTL) had failed to complete repairs. Efforts to upgrade the 80-year-old pipeline has been bogged down in a series of tender mishaps and other controversies with no progress for several years, according to reports.